Need data migration software for newly purchase Intel Solid-State Drives (SSDs)? Then you may try out Intel Data Migration Software. 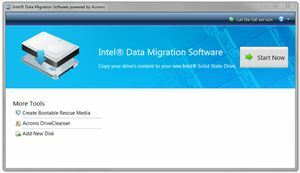 Intel Data Migration Software is a set of powerful and easy-to-use hard disk utilities which is being developed by Acronis for existing and new Intel Solid-State Drives (SSDs) users. Intel Data Migration Software copies your drive’s contents from your old storage device to your new Intel Solid-State Drive to help make this transition smooth and painless. This migration software has been designed with user friendly features that able to auto detect old and new drives, and guide the user through a simple cloning process. With Intel Migration Software, the hard disk contents such as operating systems, applications, documents and personal settings can be transferred from old to the new SSD within minutes.